Welcome to Automotive Services, we have many years' experience in all aspects of the motor trade. Our team is highly experienced and fully trained to provide a service which is second to none. Our fully equipped workshops cater for the repair and service of cars, vans and light commercial vehicles, any make or model, any age, without affecting your manufacturer's warranty. We can also mechanically service your classic car, moped and scooter, Quad bike and your power tools. If your vehicle will not drive, we offer a free recovery service to our workshops - please call for details. WE PRIDE OURSELVES ON BEING YOUR ONE STOP SHOP! As an independent garage service in Bedford, Bedfordshire we can provide tailored maintenance solutions to match your personal, business and fleet requirements. 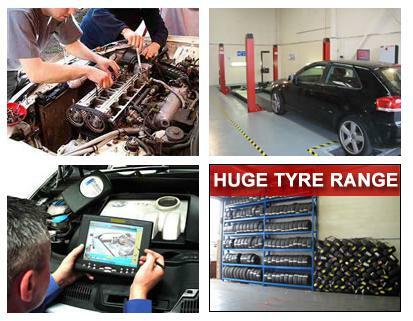 We strive to offer outstanding workmanship and customer service at unbeatable prices, whether you require a bulb, tyre, car servicing and MOTs or a complete engine, we will go that extra mile. We offer a free collection and delivery service from your home or workplace and free courtesy vehicles upon request to make life easier. Car, Van, and Light Commercial Vehicle servicing - without affecting your warranty. MOTs  Class 4, 5 and 7. Vehicle Recovery  Cars, Vans & light commercial vehicles. Heating, cooling and ventilation specialists. Massive stock of new and quality part worn tyres. We can also deal direct with most warranty, leasing and insurance companies. At Automotive services we are also Air Conditioning Specialists, for all vehicle air conditioning information, for cars, vans, trucks, plant vehicle's, coaches and more see our air conditioning company, Automotive Climate Control. "Automotive Service has the best performance of Service. Lots of receipts for the customers. I will recommend to anyone who wants a good Service." "This garage and staff are amazing. Helping us with a loan car while our car was being repaired. Enabling me to go to work, whilst my car was in the garage. Can't thank them enough." Trader reply: "Well done. Good work. Thanks."